*It’s safe to say that Colin Kaepernick is in no danger of losing his job. Media sources report the San Francisco 49ers quarterback signed a six-year contract extension with the team that will run through the 2020 season. According to the NFL Network , Kaepernick’s deal is worth up to $126 million with $61 million in guarantees. Kaepernick’s contract extension comes amid some legal trouble he experienced during the offseason. In April, the athlete was named in a police report following an incident with a woman at a Miami hotel. “That wasn’t something I was worried about,” Kaepernick said Wednesday. The extension not only benefits Kaepernick. It’s also designed to give the 49ers some flexibility to sign other players in the future. In the last year of the deal he made as a rookie, Kaepernick was paid $973,766 in base salary plus a $100,000 workout bonus in the last year of his rookie deal. “Colin’s hard work and dedication have played an integral role in the recent success of the 49ers organization,” 49ers general manager Trent Baalke said in a statement. “His work ethic, leadership and on-field production have positively influenced our team, and we look forward to his continued growth in all areas. The contract extension is the latest development in a series of accomplishments for Kaepernick. The 26-year-old football star, who took over for Alex Smith as the 49ers’ starter midway through the 2012 season, has passed for 5,046 yards and 31 touchdowns with 11 interceptions over three NFL seasons and added 937 yards and nine scores as a runner. In addition, Kaepernick has appeared in consecutive NFC Championship Games and Super Bowl XLVII. When asked what he plans to do with his increased pay, the athlete expressed at a press conference Wednesday that he wanted to, “Make sure everyone in my family is set, and I guess go from there. 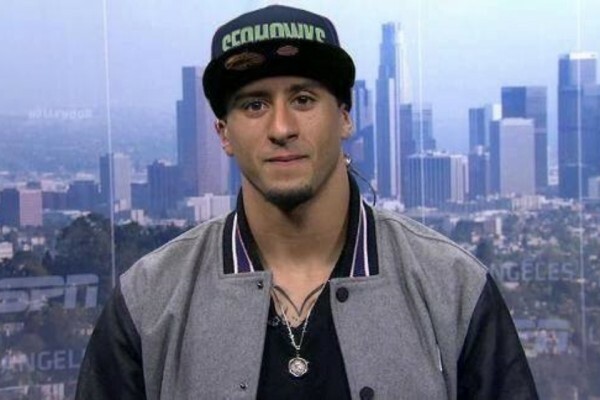 “To be able to have this compensation … is amazing,” Kaepernick said.